Was he truly yearing for “that soothing life of Nature”? Did he find London gloomy? Was Mrs. Hudson still his housekeeper? This is only one of two cases written by Holmes himself. Where does cyanea capillata fit into this case? 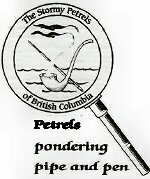 For more discussion, please join the Petrels at our next regular meeting scheduled for Tuesday, Octover 5, 2010 at 7:00 pm chez Wood. I would also like to take this opportunity to thank Peter and Audrey for their hospitality and congratulate them on 50 years of marriage!